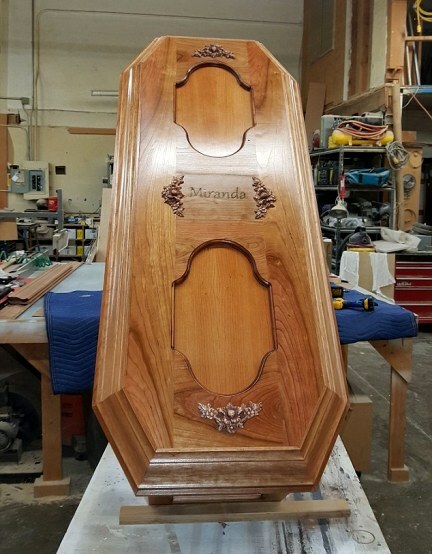 The new casket, specially made for the Little Lost Girl...who was renamed Miranda Eve. This one looks similar to the original coffin, except it has no windows. San Francisco Gate, June 4, 2016 -- She has long blond hair, she is holding a red rose and she has been dead for 145 years. Nobody knows her name or how she died. 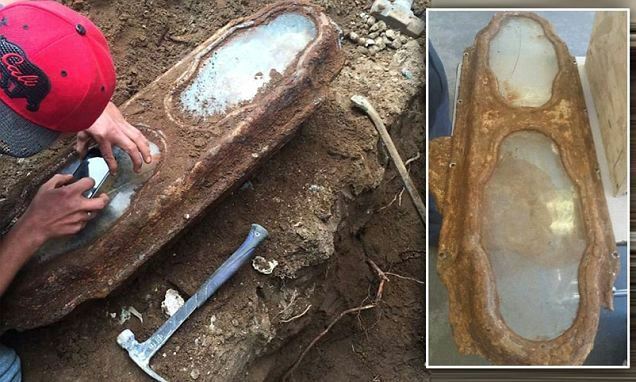 She lay under a San Francisco home’s concrete garage floor for decades until two weeks ago, when workers doing remodeling struck her lead-and-bronze coffin with their shovels. And so begins a tale of death, love, San Francisco history and the staying power of a coffin maker who knew what he was doing. 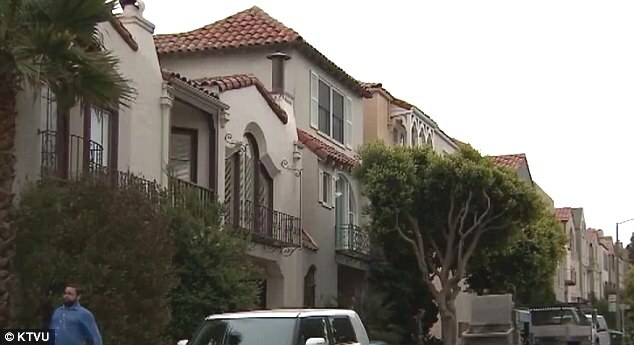 On May 9, workers at the home in the Lone Mountain neighborhood in the Richmond District discovered the casket and called authorities. 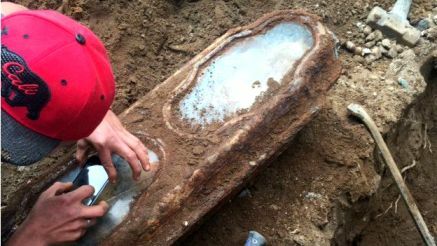 The unidentified girl, who appeared to be about 3, is believed to be one of about 30,000 people who were buried at the old Odd Fellows Cemetery in San Francisco. The bodies were moved to a common burial plot in Colma around 1920, after all the city’s graveyards were ordered closed to make way for the living. Somehow, the workers in charge of moving the Odd Fellows occupants left this girl behind. 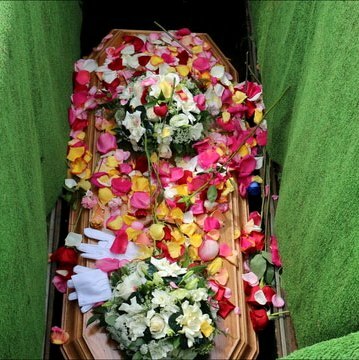 She was from a family of means, as indicated by the high-end coffin and by the fancy sealing job by the undertaker that preserved her skin and hair and her burial flowers. She looks, through the two glass windows of the coffin, like a young girl and not like the 145-year-old remains of one. Clutched in her right hand is the rose. Weaved in her curly blond hair are lavender flowers. Placed over her heart is a cross made of more lavender. Lying beside her are eucalyptus leaves. “She’s wearing a long white dress,” said Elissa Davey, the founder of the Garden of Innocence charity that, for two decades, has buried the bodies of unidentified children in California. Davey estimates that the girl died about 145 years ago because the cemetery was active from 1860 to 1890. 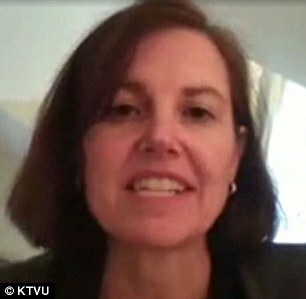 The owner of the home, Ericka Karner, quickly found herself in a bind. The medical examiner’s office told her the body was her responsibility, even though the error that left the coffin beneath her garage was not. The body was now on private property, and the private property was hers. An investigator for the medical examiner’s office confirmed its staff had been summoned following the discovery but did not take custody of the remains. Karner said she called one Colma undertaker and was quoted a price of $7,000. She called an East Bay archaeological company that handles historic artifacts and was quoted a price of $22,000. But Karner said she wanted to do the right thing, seeing as how the girl “was part of our family now.” She said the medical examiner’s office had broken the meticulously sealed casket to examine the body and that “time was beginning to be a factor,” though a medical examiner’s spokesman said that only the covers over the coffin’s windows had been removed. In desperation, with the coffin lying above ground in her backyard, Karner called authorities at City Hall. They put her in touch with Davey. Davey contacted the Odd Fellows, who agreed to supply the necessary funds. And then Davey, who works out of her office near San Diego, arranged for the body to be picked up and stored, temporarily, in a mortuary refrigerator in Fresno. 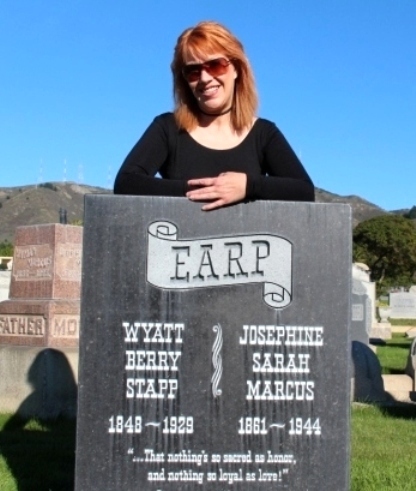 Davey hired her niece to construct a second coffin, made of maple, large enough to hold the body and the original coffin. 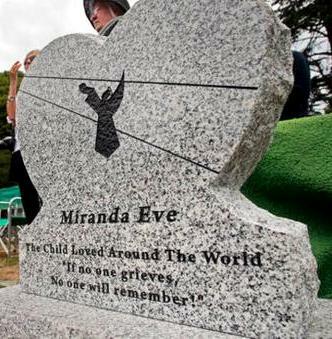 Next week, Davey will come to San Francisco for a meeting with representatives of the Odd Fellows to arrange for a reburial for the girl, who has tentatively been given the name of Miranda. 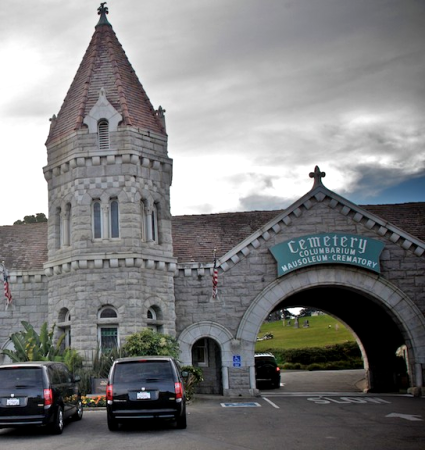 WHAT IS THE COLMA CEMETERY?